It is an unfortunate reality that many marriages end in divorce. Having a well-crafted asset protection plan can greatly reduce stress in the event of divorce. This is especially important for wealthy individuals who have a lot to lose. So, what are the best strategies for protecting assets from a spouse? The first step in creating an asset protection plan is choosing the correct jurisdiction. 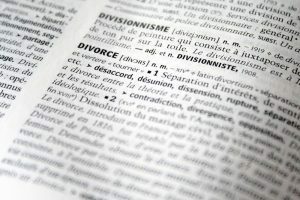 Offshore jurisdictions tend to offer the greatest results for asset protection during divorce proceedings from a spouse. That said, we discuss some domestic options that are available as well. Offshore asset protection tools offer more asset protection in divorce than the domestic asset protection tools offered in most states. This is because the top offshore jurisdictions do not recognize exception creditors. Exception creditors are creditors who have the ability to pierce through the protection provided by asset protection structures. In every domestic jurisdiction except Nevada, divorce and child support creditors are able to reach assets held within domestic trusts. 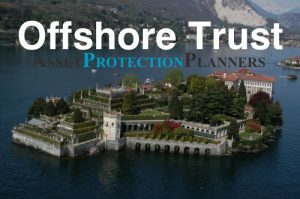 Offshore trusts offer some of the best strategies for protect assets from a spouse asset protection strategies and pre-divorce planning techniques. These offshore trusts work in a very similar way as the domestic asset protection trusts. The main advantage of offshore trusts over domestic asset protection trusts has to do with fraudulent transfer claims. Fraudulent transfer occurs when someone transfers assets with the expressed intent of defrauding creditors. These creditors can include former spouses during and after divorce cases. Fraudulent transfer occurs when one spouse transfers assets immediately before one of the parties files for divorce. It can also occur if one spouse transfers assets when divorce is reasonably imminent. An example of this is after one spouse catches the other spouse cheating. The burden of proof for fraudulent transfer claims in most domestic asset protection trust jurisdictions is clear and convincing evidence. If one former spouse is able to show intent on behalf of the other spouse, the burden of proof will transferred to the spouse with the trust. The accused spouse will have to prove that they did not intend to make a fraudulent transfer of assets. The burden of proof in offshore jurisdiction lies completely with the spouse trying to make a claim on trust assets. Some offshore jurisdictions, including the Cook Islands and Nevis, have a burden of proof which is beyond all reasonable doubt. This means that a former spouse making an accusation of fraudulent transfer in these jurisdictions must meet the same standard of proof necessary for a murder case. We have never had client in a divorce case lose money held in a Cook Islands trust or Nevis trust that we have established. Additionally, many offshore jurisdictions do not recognize foreign judgements. In order for a former spouse to make a claim of fraudulent transfer, they re-adjudicate the case in the jurisdiction where the other spouse set up the trust. The time and cost associated with this alone may be enough to discourage a former spouse from pursuing the assets held in the trust. 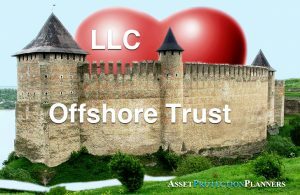 As a result, offshore trusts may be advantageous over domestic asset protection trusts in the event of divorce. The trust owns 100% of the LLC. We help the client open bank/investment accounts in the Nevis LLC name. When a lawsuit threatens the assets, the trustee — our Cook Islands law firm — steps in as manager of the LLC and protects the assets. Any domestic court-orders fall on deaf ears because your local courts do not have jurisdiction over Cook Islands trustee. Offshore business entities are separate legal entities from their owners. These business entities include limited liability companies and corporations. Because of the statutes in certain offshore havens, the LLC business entities are legally separate from their owners. Thus, they are not subject to the claims of their owner’s creditors. This is especially the case with the Nevis LLC and the Cook Islands LLC. One cannot use the debts and obligations of the business as the basis for a claim against the owner’s personal assets. Likewise, personal creditors of the owner may not make make claims against assets held by the LLC. If one spouse owns the assets inside of an offshore business entity rather than an individual, this can provide immunity from claims a former spouse makes during divorce proceedings. First, the divorcing spouse seeking asset protection establishes an offshore trust. (The spouse establishing the trust is called the trust settlor.) Next, the settlor of the trust establishes a limited liability company. The trust owns 100% of the LLC. The settlor then opens a bank account in the name of the LLC. The trust settlor transfers assets into the company account. As a result, it no longer legally ties those assets to the settlor. Under normal circumstances, the settlor of the trust may appoint himself or herself as the manager of the company. This allows them to control the assets held by the company. In times of legal duress, the trustee can assume the managerial role of the company. This prevents a divorcing spouse from making any claim against the assets LLC inside of the trust holds. Knowing whether a person is living in a common law property or community property state is essential for crafting a successful asset protection strategy. 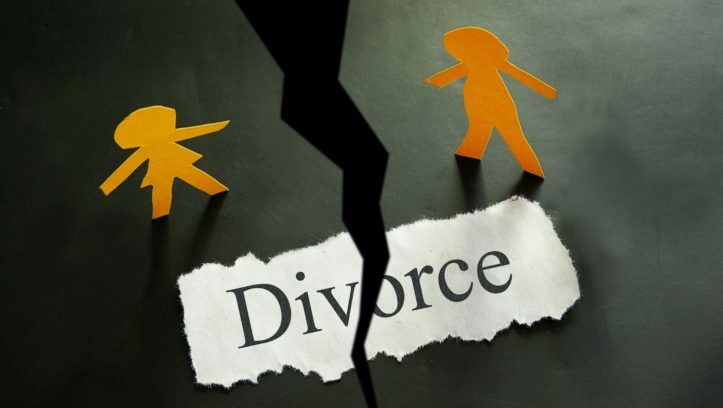 This is because the jurisdiction where the couple resides has a significant impact on the way that the law divides the assets in the event of divorce. Particularly, this is relevant when considering the primary residence of the couple or any other US real estate. Real estate is always subject to the laws of the jurisdiction where it is located. For this reason, it is advisable that anyone considering asset protection develop a basic understanding of their local property law. The laws of each state define it as either common a law property state or a community property state for this purpose. In the United States, the majority of states common law property states. Property one spouse acquires during marriage is the sole property of that spouse in a common law state. Property which the married couple purchased jointly and titled in both their names is the only type of property the law considers joint property. Each spouse owns one half of the joint property in common law states. The court determines the division of property under common law. The courts attempt to distribute common law property equitably rather than equally. This ensures the compensation of both parties by what they put into the marriage. States which are not common law property states are community property states. These states include Arizona, California, Idaho, Louisiana, Nevada, New Mexico, Texas, Washington, and Wisconsin. These states have three different forms of property under the law: separate property, community property, and quasi community property. Separate property is property which one individual spouse acquired before he or she was married. Community property also includes property received as a gift or inheritance by one spouse during marriage. Separate property can also include property which the couple has agreed to consider separate. The creditors of one spouse may not make claims against the separate property of the other spouse during marriage. Community property is property which both spouses owned jointly. Community property may only be owned by married people. This couple must be domiciled in a community property state. Community property may be real estate, jewelry, stocks, bonds, and other types of personal property. It may be located anywhere in the world. Either of the spouses or both may be manage, control and direct it. The co-extensive interest in community property applies to both spouses. The creditor of one spouse has the ability to reach all of the community property owned by both parties. This is applicable to debts and obligations which either spouse incurred prior to or during the marriage. The law can also consider property as quasi-community property. This is the case if the law considered property community property they had acquired it in a community property state. The law may classify both real and personal property as quasi-community property. Regarding liability, it is quasi-community property community property in states which observe community property law. Prenuptial agreements are legal agreements which people make before they marry. Postnuptial agreements are agreements made between spouses after they marry. Couples can use prenuptial and postnuptial agreements to assist in the division of assets if they divorce. In order for prenuptial and postnuptial asset protection agreements to be valid in most states, they must be made in writing. Both parties must also be entering into the agreement voluntarily in order for it to be considered valid. During divorce proceedings, it is very common for former spouses to challenge prenuptial and postnuptial agreements. Usually, a former spouse must prove that the agreement was made as the result of undue influence and/or misrepresentation in order to have it overturned. The courts will consider several factors with regards to overturning a prenuptial or postnuptial agreement. These considerations include extreme disparities between the parties in age or knowledge. They also include lack of adequate counsel and vulnerabilities created by specific circumstances such as poverty, pregnancy, or illness. Prenuptial and postnuptial agreements can be useful tools for asset protection planning. However, they certainly are not bulletproof. A domestic asset protection trusts is another popular legal vehicle which one can use to protect assets in the event of divorce. Domestic asset protection trusts allow for settlors of trusts to also act as the beneficiary and a co-trustee. These trusts are irrevocable. 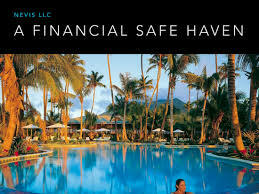 They are often referred to as self-settled asset protection trusts. By acting as a co-trustee, the settlor may maintain some control of the trust. However, another co-trustee must be appointed in order to protect assets from the claims of a former spouse. The co-trustee must have discretion over the distribution of assets held in the trust. This is essential in order for the trust to protect the assets. 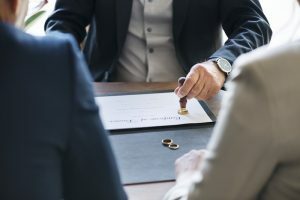 Asset protection trusts can be effective in cases of divorce since the settlor does not have control over trust distributions. As a result, it protects the assets from the claims of a former spouse. The co-trustee is also banned from making distributions if they can reasonably assume that a former spouse would seize them. The beneficiary, who in this case may also be the settlor and trustee, does not control distributions. It is important to note that many domestic asset protection states allow former spouses to act as exception creditors. This means that domestic asset protection trusts will not be effective in protecting assets from divorce in the majority of states where they are offered. However, there are states which do not have exception creditors, such as Nevada. These states offer trusts which will protect assets in the event of divorce. 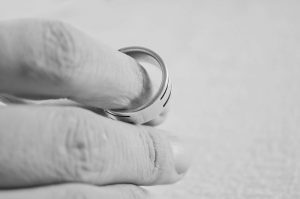 A person looking to use a domestic asset protection trust for protection in divorce must pick the right jurisdiction. Moreover, a California, New York or Florida judge, for example, may ignore a Nevada trust and seize the assets regardless of what the law says in Nevada. That is one reason why an offshore trust jurisdiction is almost always the best divorce asset protection strategy in divorce compared to domestic trust options.